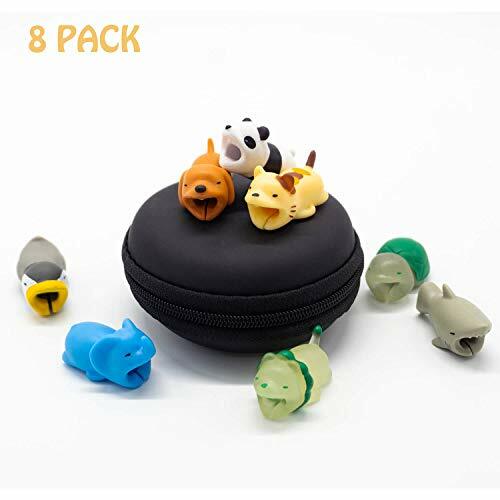 WHAT IN BOX - 2 luminous lion and tortoise,6 cute cable citers(panda, penguin, kitten, elephant, shark, dog) in a black round carrying case. PROTECT YOUR CHARGING CABLE - These cable bites are excellent in preventing the outer part of cable from breaking, which may usually happen while disconnecting the cable. FUNNY GIFT - Do you see how lovely these animals are. Not only useful, cable bites animals are also cute and nice.It\'s a special funny gift for your girlfriends,boyfriends,family,sons or daughters.No one will refuse to get them.